Distinguished guests, good afternoon! I’m honored to deliver my speech as a member of China’s economic community after two Nobel Economics Prize winners at this grand event. Firstly, I would like to congratulate Professor Gregory Chow and Xiaohong Chen on winning the China Economics Prize that is considered as the most important prize in facilitating innovations of theories and methods in China. I would also like to express my gratitude to National Economics Foundation for organizing this event to promote theoretical and method innovations of economics in China. It is known that theoretical innovations come from insufficient explanation for new phenomena with existing theories. The phenomenon in China from the reform and opening up in 1978 can be regarded as a miracle in the economic history, because it is impossible or difficult to explain the phenomenon with existing theories. In 1978, as one of the poorest countries, China was at the beginning of its transition from the planned economy to the market economy. Its per capita GDP was even less than one third of the average number of sub-Saharan African countries at that time. 38 years after 1978, China’s annual economic growth reached 9.6% last year, which is an unprecedented high-speed and long-lasting growth for any economy in the economic history. Over 700 million Chinese have lifted themselves from the international poverty line of 1.25 U.S. dollar a day due to such an economic growth. China has been making great contributions to human poverty alleviation. Meanwhile, China is the only country who have not seen a systematic financial crisis in the past four decades. Why have China made such an achievement? Deng Xiaoping is the general designer of China’s reform and opening up. In his words, China was crossing the river by feeling the stones instead of using existing theories to guide the transition from the planned economy to the market economy. In addition to no existing theoretical guidance, some measures taken in the reform and opening up process were considered as incorrect according to theories at that time. For example, the “grandfather clause” had been adopted in the reform and opening up process to continue the protection for inefficient state-owned enterprises with subsidies, leading to lots of distortions and interventions maintained in the economy. Certainly, China also opened access for some new industries in accordance with China’s comparative advantages, and special economic zones and export processing zones were established with investment promotion policies to guide the development of these industries according to the trend. In 80s and 90s, China was in the process of reform and opening up; other socialist countries were in the transition from the planned economy to the market economy; and most developing countries in Latin America, South Asia and Africa were also in the reform and opening up. The mainstream consensus was that the planned economy is less efficient than the market economy, so privatization, marketization, balanced budget and liberalization advocated in the Washington Consensus should be implemented in the transition from the planned economy to the market economy to achieve the reform once for all. A popular metaphor in the economic community at that time was that you need to jump over the river from the planed-economy side to the market-economy side at one go instead of making several jumps, or you will fall to the bottom. There was another consensus that the progressive dual-track transition, such as that in China, would make the economy worse and less efficient than the original planned economy. However, looking back, China has been a country with the fastest and most stable economic development in the past forty years. On the contrary, countries complying with shock therapy of the Washington Consensus encountered the economic collapse and have been trapped in crises. China’s achievements in economic transition cannot be explained and would be regarded as incorrect in accordance with past theories. Yet there are always reasons for a success, and the reveal would be a new contribution to theory. Differences between M-form and U-form organizations proposed by Yingyi Qian and Chenggang Xu just reveal reasons of China’s successful reform and opening up. I was absent last year and failed to congratulate them face to face. 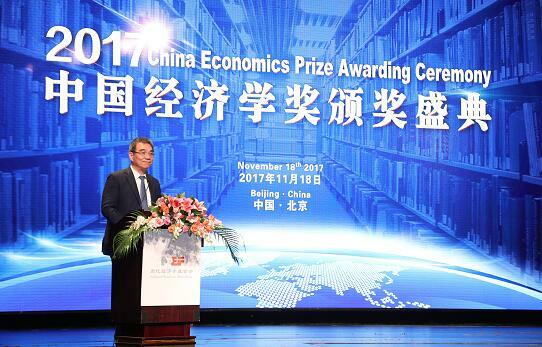 I would like to take today’s opportunity to congratulate Professor Yingyi Qian and Chenggang Xu on winning the first China Economics Prize. Certainly, a theory is just the causality among several simple socioeconomic variables, while the actual socioeconomic variables are numerous. If a phenomenon can be explained by a theory with a self-consistent internal logic, other scholars can also explain it with another casual system consisting of other socioeconomic variables. In other words, if a phenomenon can be explained with a theory, it can definitely be explained by many other theories, and all theories possess self-consistent internal logics. Then which theory reveal the causality of the phenomenon indeed? If all causalities of these theories can be the explanation of the phenomenon, which one is the primary contributor and which one is the secondary? These questions cannot be clarified with a theoretical model itself. In order to identify the theory that truly explains an observed phenomenon or the primary contributor to a phenomenon, strict, data-based econometric methods need to be adopted to conduct verification. On one hand, we should collect data; on the other hand, new appropriate econometric methods should be created to avoid the situation that everyone sticks to own opinion. Today’s prize owner, Professor Gregory Chow and Professor Xiaohong Chen are scholars making significant contributions to econometric methods. Congratulations again! What’s the aim of promoting theoretical innovations? Theories help people to understand phenomena in the world, and it is expected that the understanding can help people to change the world for the better. Currently, most economic theories come from developed countries, which may be valuable for explaining phenomena in developed countries. Usually, scholars in developing countries think there are reasons for the successes of developed countries, and as long as they master and apply these reasons in developing countries, they will be able to catch up with developed countries. Economics is known as a prestigious social science discipline in China, as well as in other developing countries. Generally, theories in developed countries can provide clear explanation to problems in developing countries; however, few developing countries achieve success by making policies according to those theories. During the First World War, nationalism was surging vigorously; after the Second World War, developing countries successively gained its independence from the colonial or semi-colonial rule, and started to pursue modernization. Most of them refer to theories and experience of developed countries as guidance for policy making. There are over 200 developing economies after the Second World War, only two of which have entered the high-income level from the low-income level now. They are China’s Taiwan and South Korea. Mainland China may be the third one after 2025. As I mentioned, most developing economies and developing countries can clearly explain their current problems by referring to theories of developed countries when pursuing modernization of the country; however, only a few economies achieve successes by making policies based on these theories. Why? On the contrary, a few economies successfully achieving their transition took policies that are usually incorrect according to existing theories. I think the most important reason is that applicability of a theory is determined by its preconditions. It is inevitable that theories from developed countries take conditions of developed countries as preconditions or implicit assumptions. Even if phenomena in developing countries seem to be similar with those in developed countries, preconditions behind are different. Therefore, if these theories are applied in developing countries as guidance for policy practice, inadaptability will be a common result. Hence, if developing countries expect to realize the purpose of “understanding the world and changing the world” with economics theories, theoretical innovations based on practical experience of developing countries themselves are highly needed. It is significant that National Economics Foundation has been facilitating theoretical and method innovations of economics in China. These innovative theories can offer better explanation for the success and problems in China, a developing country in the transition. In addition, 85% of the global population are living in developing countries currently; thus China’s theoretical innovations will provide better reference value for other developing countries in solving their problems. In 1995, at the 40th anniversary of Economic Research Journal, China’s most important economics journal, I wrote an article of congratulation on invitation, titled “Localization, standardization and internationalization”. I advocated that China’s economists should study the local economic phenomenon in China with international standard methods including mathematical modeling and econometric test methods; and these results would make innovative contribution to human knowledge increment. Four economists, prize winners this year and last year, are all outstanding practitioners of the above idea. I also made a prediction in that article: in 21st century, probably China will become a research center of the global economics, and there will be a number of world-renowned great economists in the field of China’s economic problem research. I have reasons for my prediction. An economic theory is no more than a simple logical system, and for a theory, the simpler, the better. In this case, how can you determine that one theory makes more significant contribution than another? They are all simple logics. Actually, the significance of a theory is determined by the significance of the phenomenon it is for. If the phenomenon is significant, the theory offering the explanation and causal logic for it will be a significant one. What is a significant phenomenon? A phenomenon in an important country is a significant one. In the modern economics history, after modern economics was established by Adam Smith with the published Wealth of Nations, the research center of global economics was the UK from the end of 18th century to the middle of 20th century. During that period, economists making substantial contributions were mostly British or foreign economists working in the UK. The UK can be considered as the global economics research center before the middle of 20th century. After that, the US has been the center until now. The UK was the largest economy in the world from the industrial revolution to the First World War, and it was the world’s economic center. After the First World War, the economic center was gradually shifted to the US. Significant phenomena are phenomena in the world’s economic center, which means the research center of the global economics will shift with the global economic center. According to purchasing power parity (PPP), China has become the world’s largest economy in 2014. As long as it maintains stable development, it is probable that China will still be the world’s largest economy around 2050 according to market exchange rates. Currently, China’s economic scale accounts for 18% of the global scale, and it will increase to over 20% in 2025. It is expected that in 2025, China will take up 25% to 30% of the world’s economic scale. China will be the most important center in the global economics, and the global economic research center will probably be shifted from the US to China. Today, at this award ceremony, we are probably witnessing the arrival of a new era that is significant for human beings. China has gradually turned into a middle-income country from the poorest country, and will become a high-income country in the future. Most countries in the world are still developing countries, half of which are low-income countries and the other half are middle-income ones. They also have an aspiration of achieving modernization and ascending to the high-income group. Theoretical innovations based on China’s experience should be summarized, and their contributions should be verified by developing better test methods. We can do well to our career, we can also do good to the world! Thank you!